It's increasingly pointless trying to pick out trends in the beer world as the diversity of directions in which brewers are heading shows no sign of abating. Yet there does seem to be quite a fascination right now with the blurring of lines between beer and wine. Whether it's brewers adding grape juice or wine wort to beer or allowing grape must to ferment their beer, there's plenty of experimentation going on. Such as this: a collaboration between former winemaker Jayne Lewis of Two Birds Brewing and Ryan O'Meara from Express Winemakers. The pair studied winemaking at the same uni before working together at Little Creatures in Freo back in the middle of the last decade. Now they're back in action once more for a one-off called Chardonnale that they're tagging a "beverage without borders". 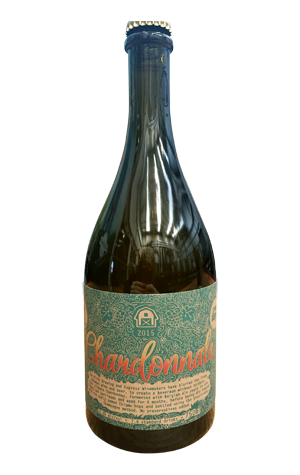 Cool climate Chardonnay was fermented with Belgian ale yeast in old French oak barriques where it then spent six months before being dry hopped with Australian Enigma hops and bottled using the traditional Champagne method. A very limited amount has been released in, of course, 750ml wine bottles.